major step towards sustaining cassava production in the state must involve practices that will reduce the cost of production so that the farmers can make profit or at least break even. To this effect we will discuss stem management related issues and field establishment practices as a way of tackling the common mistakes in cassava production. 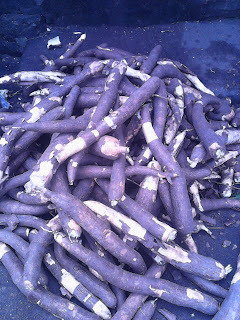 Examples are TMS98/0505, TME419, TMS98/0002, TMS98/0581, nr 8082, UMUCASS36 and 37 (yellow root cassava) that contains vitamin A etc. You have to select stems carefully. Spindled-shaped or tiny shape or premature stems are not good when you are planting for good root yields. Select healthy stems for planting, from the mother plant. The stake should be 20cm – 25cm long, 75g – 88g, with 5-7 modes. The stem should be at least 7-8 months of age as at the time it was severed from the mother plant. Use cutlass, machete or secateurs or other sharp tools to do the cutting. You should aim at having sharp and smooth cut age. The day of cutting stems and the day of planting stakes from it should be as close as possible. This is important for high vigour/sprouting and emergence. When logistic difficulties call for occasional storage of stem after cutting, the long stems are the ones you should store. The variation in the different characteristics among the stakes planted is reflected by the yield of each plant at harvest. For example, yield is related to age of plant from which the cutting was taken, rank, type of stem, length of stakes number of intact, pit-diameter ratio of stake, days after cutting the stem, etc. You require 55-60 bundles of cassava stem to plant one hectare. Each bundle contains 50 stems, each 1m long. You may also use neem leaf powder at 1kg/5 litres of water. Neem tree is a medicinal plant. Ensure you plant in well pulverized, weed-free seedbed. Apart from ploughing, harrowing and ridging, you may have o apply a systematic herbicide to take care of weed like carpet grass and guinea grass. Plant stakes in slanting form (at about angle of 450), with 2/3 stakes buried in the seed already prepared (i.e. ridge/mound/flat). You may also plant/place the stake horizontally to the soil surface. This will give rise to multiple stems and roots. 1) Plant in rows or lines for ease of operations like weeding and fertilizer application etc. 3) Plant early in the season, March - May. Weed the farm at 4-7 weeks after planting. The second weeding is at 12 weeks after planting. The cost of manual/hoe weeding gives rise to about 30 – 40% of total cost of production in many locations. It is therefore of great importance to advise farmers in the state to adopt the use of herbicides. This will to a great extent contribute to the reduction in the cost of production. The farmers can apply pre-emergence herbicides like primetra Gold, Cotoran, Atrazin etc and later apply post emergence contact herbicides like Gramoxone to control weed under growths. An important axiom here is to keep field weed free within the first 90 days. Depending on availability, the following grades can be used. In addition to application of mineral fertilizers, you can apply Agricultural lime in areas you have soils that are acidic. You can also apply organic manure where it is available. Apply fertilizer immediately after first weeding i.e. 4 – 7 weeks after planting. Apply 8 bags of NPK type of fertilizer or its equivalent per hectare. Harvesting the early maturing types 10- 12 months after planting. The late maturing type should be harvested later. i) Odourless fufu; by retting-peeled roots are submerged in water in a container for about 3 – 4 days until they are soft (ii) High quality cassava flour (iii) Garri. Other uses of cassava products are; livestock feed, sweeteners, confectioneries, glues, paper, textiles, plywood, pharmaceutical product etc. Here cassava is the main crop while maize, and melon or other crops are supplement. Cassava is planted on the crest of ridges while maize is planted on the base of ridges/mounds made. Melon is planted on the side of the ridges/mounds. All techniques and operations carried out in cassava production are applied. It is my sincere belief that if adequate measures are taken to handle the aforementioned factors, regarded here as common mistakes, farmers will have cause to smile during their subsequent harvest. I will advice you to go into catfish because catfish is very strong, resist diseases and has market value. Starting depends on the available resources. If you don't have enough money I will advice you to construct Trampoline pond. Hatching your own fries will make you to maximize profit.